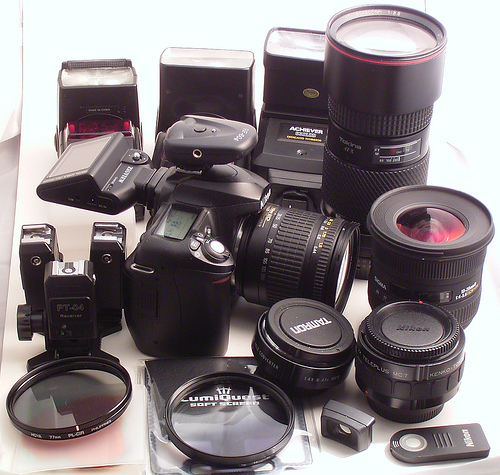 This article is part of a series on the various different types of cameras available today. DSLR stands for Digital Single Lens Reflex. The 'Single Lens' part of the name refers to the fact that the viewfinder looks through the same lens that is used to take the photo (as opposed to a TLR). The 'Reflex' part of the name meanwhile, refers to the mirror that is used to reflect the light up into the camera's viewfinder. (Actually, the light is reflected up into a pentaprism, which then reflects the light into the viewfinder - the pentaprism is what causes the viewfinder hump on DSLR bodies). Normally the mirror is in front of the camera's sensor, but when you press the shutter button the mirror flips up out of the way, so that the sensor can be exposed. When this happens, no light can be reflected into the viewfinder, which is known as viewfinder blackout. SLT stands for Single Lens Translucent. 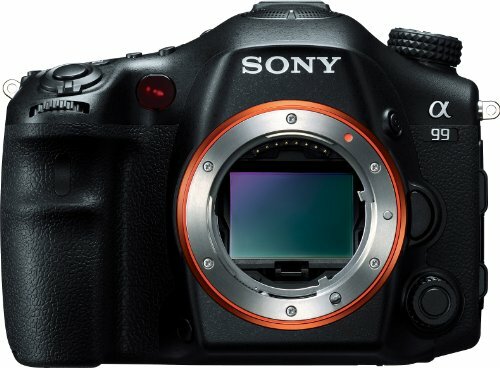 SLTs are very similar to DSLRs, except they have a fixed translucent mirror in front of the sensor. Most of the light is passed straight through the mirror towards the sensor, while part of it is reflected up. Although SLTs can use an optical viewfinder, the same as most DSLRs, all current SLT models use an electronic viewfinder. This has some advantages - the image in an electronic viewfinder can be adjusted to take account of the current camera settings, such as exposure, giving a more accurate representation of the final image. This can be a big benefit. In low light levels though, the update of an electronic viewfinder may become slow and the image more grainy. Since the mirror in an SLT is fixed, light is still reflected into the viewfinder even while an image is being exposed, so there is no viewfinder blackout when shooting. DSLR models are currently available from Sigma, Nikon, Sony, Canon, and Pentax, each manufacturer using a different lens mount. Previously both Panasonic and Olympus produced DSLRs with a 4/3 sized sensor and shared lens mount, and Samsung produced DSLRs using the Pentax lens mount, but they now seem to have focused their attention on Mirrorless cameras. 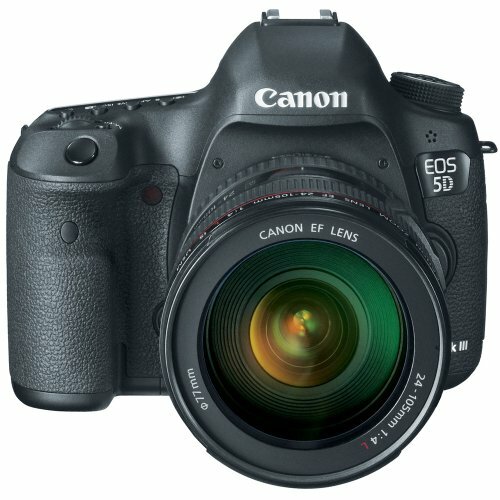 All current DSLRs have a good level of image quality. Higher end (more expensive) models tend to have more megapixels or better performance in low light, better autofocus performance, weather sealed bodies, and other improvements in more advanced functionality. 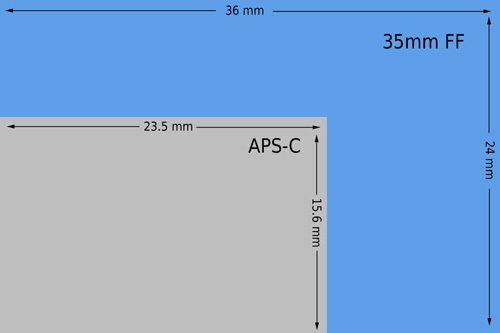 Why is sensor size important? For a given resolution, the larger the image sensor, the more light each 'pixel' will gather. The more light, the higher the signal to noise ratio, and the less digital noise you'll see in the resultant image. For a given perspective, a larger sensor will allow greater control over depth of field, making it easier to seperate your subject from the background. The advantage of smaller sensors, on the other hand, is that for a given perspective, a shorter focal length lens can be used, thanks to the smaller sensor's crop factor. Shorter focal length lenses tend to be cheaper and lighter, particularly in the telephoto range. DSLRs are typically available with two sensor sizes - APS-C (roughly equivalent to the same size as a frame of APS-C film), and Full Frame (roughly equivalent to a frame of 35mm film). Full frame sensors are more expensive to produce, and this is reflected in the price of full frame DSLRs. DSLR manufacturers produce lenses that fit both their full frame and APS-C cameras, and also lenses specially designed for just their APS-C cameras. Lenses designed for use with APS-C cameras usually have some designation to indicate this, e.g. DX for Nikon or EF-S for Canon. 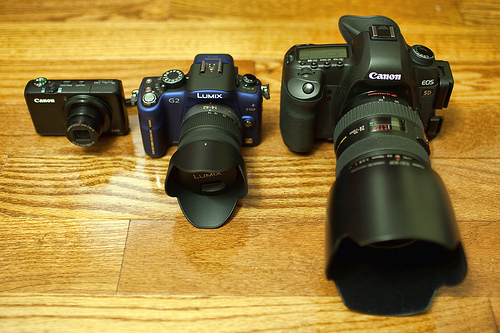 DSLRs and SLTs both have interchangeable lenses, which is one of their main selling points. Unfortunately most manufacturers use their own lens mount, so for example, a lens designed for a Nikon DSLR cannot be easily used on a Canon DSLR, and vice versa. DSLRs have been around a relatively long time, so there are a large choice of lenses that can be purchased, and a good second hand market as well. The large majority of lenses designed for film cameras can also be used on DSLRs, so long as they use the same mount. 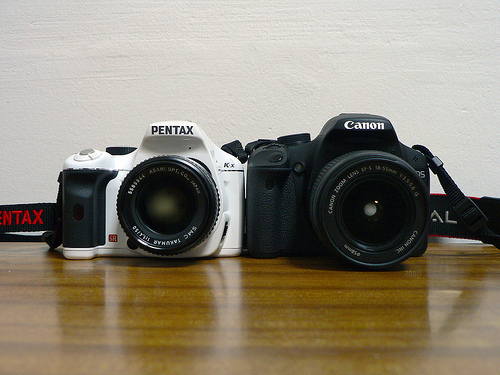 For Canon DSLRs, adapters can also be purchased to allow using lenses designed for other camera mounts. There are also a wide range of accessories available for DSLRs, including external flashes, macro flash units, rigs to make video shooting easier, Wi-fi adapters, battery grips. Again, this is quite a mature market, so there is a large choice available, including from cheaper third party manufacturers. The large image sensor size gives DSLRs and SLTs a big advantage over compact cameras when it comes to image quality, especially in low light. The ability to take photos with a shallow depth of field, and change lenses are also big advantages. The larger bodies of DSLRs/SLTs allows for more buttons and dials on the camera body, allowing you to change settings easily without having to dive into the menus. And all DSLRs allow you to easily control the important settings of shutter speed, aperture, and ISO. Compared to MILCs, DSLRs have faster autofocus performance in low light. 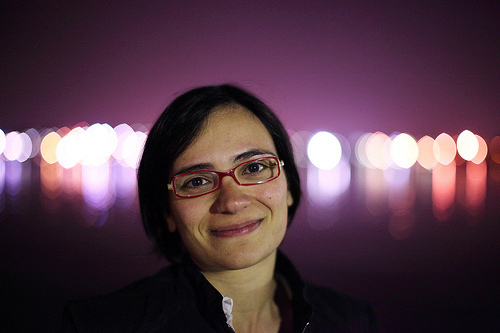 The optical viewfinder of a DSLR can also be a great boon for working in low light levels. Higher end DSLR and SLT models should be more resistant to rain and dirt than currently available MILC models. And if you want the top-end image quality and depth of field control of a full-frame sensor (and don't mind the cost), other than the Leica M9 rangefinder, a DSLR is your only choice. The main disadvantage of DSLRs and SLTs is that their large sensors and the space needed for the mirror in front of the image sensor means they are relatively large and heavy. High end models are very expensive, and likewise high end lenses. Because of their large size, and their usage by professional photographers, DSLRs can be banned in places (e.g. some sports games) where other smaller cameras are still allowed. On the whole though, the majority of locations either allow or disallow all photography rather than making a distinction based on the type of camera you are using. DSLRs, with their great image quality, depth of field control, and large range of lenses and accessories, can make a great choice for photographers looking to step-up from a compact camera. The basic DSLR models offer all the crucial controls needed for creative photography, at a price that is not much more than, or sometimes even less than, high end compact cameras.